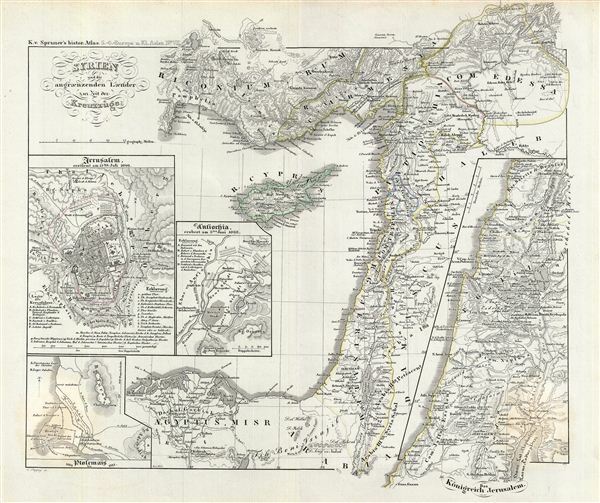 This is Karl von Spruner's 1854 historical map of Israel, Palestine or the Holy Land, and the adjacent regions at the time of the Crusades. The map covers from southern Turkey to egypt's Nile Delta, inclusive of Cyprus, and extends eastward as far as Damascus in modern day Syria. The map also includes four inset maps. The first inset details Jerusalem on the 15th of July, 1099, marking the last day of the Siege of Jerusalem which lasted June 7 to July 15, 1099, when the crusaders captured the city from the Fatimid Islamic Caliphate. A second inset map details Antioch captured on the 3rd of June, 1098, marking the day after the Siege of Antioch. The other two inset maps detail Ptolemais from 1189 to 1191 and the short lived crusader Kingdom Jerusalem or what is today northern Israel and Lebanon. The whole is rendered in finely engraved detail exhibiting throughout the fine craftsmanship of the Perthes firm. Prepared by Karl Spruner for publication as plate S-O VII in the second edition of Justus Perthes' Historich-Geographischer, Hand-Atlas zur Geschichte der Staaten europa's vom Anfang des Mittelalters bis auf die Neueste Zeit.